No racing today. Too light winds. After a long delay, the race committee fired off one start. We got around first mark 4th then they abandoned. Wind was non existent. Walker Cup results as per yesterday. Next event is Masters next weekend. 20 Stars competed in three races today onBiscayne Bay. The wind was 7 knots from the southeast for race one and built to 11 knots for race 3. As usual, Miami delivered perfect Star sailing conditions. I am privileged to be sailing with Olympic Gold medalist Magnus Liljedahl for this weekend. We started the racing off with a win and followed that up with third and then a second.Vasyl Guretev and Vitaliy Kushnir of the Ukrane won the second race in classic Biscayne Bay style by hitting the left hard upwind. My good friends Larry Whipple with Austin Sperry crewing won the third race. The right side paid in the final race and Whip led the entire way! Augie Diaz had a good day with a 8,2,3 and will be tough to beat as usual. Two races on the card for tomorrow. For complete scores go to www.yachtscoring.com and look for the Walker Cup. Harry Walker was a life long Star sailor, acted as the class secretary for 25 years, acted as secretary of the “Life Members” and was a fixture in racing down here in Miami. This regatta is in his memory. Sorry I did not write any personal updates during this event. Just went and had fun! Coconut Grove, FL (January 13, 2014) – America’s Cup skipper and Sailing Hall of Fame member Paul Cayard has returned to the class he loved, and it showed today; the 55-year old San Franciscan stayed calm, cool and collected in the hot Sunday sun as he sailed to a solid second-place finish in today’s only race. Cayard and Australian crew Rodney Hagebols’ performance was enough to give them a 9-point victory over California’s Jim Buckingham; 2-time Olympian Cayard earned the second-ever Star Midwinter Championship title despite a tough start to the 7-race series. This was only Cayard’s second regatta since returning to the Star Class last month; after failing to break the top ten at last month’s Star Sailors League final in the Bahamas, Cayard has finally ‘come home’ with a regatta win at the fourth event in Miami’s Star Winter Series Presented By EFG. Cayard was all smiles as he accepted the Star Midwinter trophy. “Wherever my voyages take me, I’m always happiest when I’m back in the Star Class,” he said. Caught out on the wrong side of that first shift, Diaz was frustrated with his start. “We had two goals going into the last race: Protect the left, and stay near our competition,” said Diaz. “We accomplished the first goal, but not the second.” Both second place Jim Buckingham (sailing with Olympic medalist and local sailing hero Magnus Liljedahl) and Cayard sailed away to the top right side while Diaz fought for a top 15 position at the mark. Buckingham would trail Hornos in second place for much of the race, but it was Cayard who fought from 8th position at the first mark all the way past Buckingham to claim second by the finish. “We really thought we’d get Tomas, but when we gybed into the center of the course on the final run, he and Cayard both found a little more pressure and a little more current, dropping us back to third,” said Buckingham. Buckingham’s third place locked up second for the Midwinter Championship, but more importantly, it gave him a one-point lead over Augie Diaz/Arnie Baltins in the all-important Star Winter Series overall points score with just one event to go. “We won’t have the luxury of dropping any results since we missed the last event [the Series Score is the sum of the top 4 of the 5 schedule regattas], but with the Midwinters counting double, we’re in a good position going into the final regatta next month,” said Buckingham. It will be winner-take-all between Buckingham and Diaz; Augie won the inaugural Series Trophy by a landslide last year, but those days are over according to ‘Buck’. “Augie’s already got his name up there, and we can’t have the Star Winter Series being the “Augie Diaz Perpetual Trophy!” he joked. 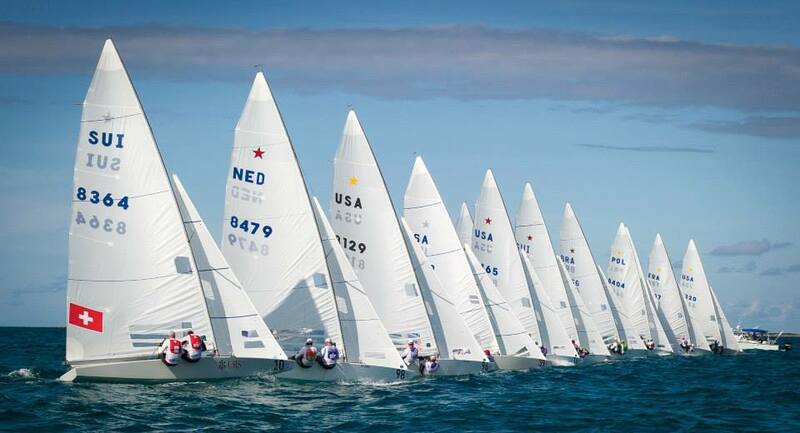 The overall series title will be decided during February 8-9’s Walker Cup, the final event in the Star Winter Series Presented by EFG, when another star-studded fleet will descend on Miami for the 2-day, 5 race regatta. Two races were held today in 10-12 knots out of the east. Austin and I went into todays races at the back of the leader board, but had a good day and managed to climb up a few positions. We got off to a great start leading race 1 around the first lap, losing the lead to Mark Mendleblatt at the second windward mark, and then regaining the lead only to be finally overhauled by the king, Robert Scheidt, on the final run. At that point we were in 11th place, 5 points out of 10th, which we needed to be in in order to move on to tomorrows racing. We had a decent start in the second race but didn’t do so well up the first beat and were near the back after the first lap. We tightened things up on the second lap and came home with a 13th. That put us 12th overall, 8 points off the cut for the semi finals tomorrow. Honestly, I don’t deserve to be better than 12th in this fleet right now and I didn’t deserve to beat Robert in race 1 today. He works very hard to be as good as he is. There is no way a guy who hasn’t sailed in 4 years should be able to walk into this class and win a race in this fleet. That’s why I race Stars. Since concluding the Cup last summer, it has been my plan to get back into the Star. I was thinking of starting out with some regattas in Miami this winter and working up to the Bacardi Cup in March. But I jumped in to the deep end instead and I am leaving Nassau better for it. I feel energized to be out competing again and looking forward to more soon. I think the SSL is a great concept and Michel Niklaus has made an innovative step forward in sailing at the highest level. The format, having several “cuts” is exciting and tomorrow’s semi-finals and finals races will be a first in sailing. Robert is definitely the torch bearer at the moment, however as the points get zero’d out at every stage, it will take just one good race by someone else to take the top prize of $40k. Forecast for tomorrow is the same…more perfection in paradise. Three races were held today in perfect conditions, once again. East winds of 10-14 knots and bright sunshine made for another postcard day in Nassau. Austin and I got off to a good start with a fourth place in the first race of the day. We had a great start, good speed upwind so we were able to stay a head of the heavy traffic. In the next two races we made mistakes of various types and finished near the back each time. Those races were humbling. The German team that was last after yesterday’s racing had a 5, 5, 1 and moved up to 7th. We are 17th overall, 9 points out of 10th place. It is all very tight. We have to put together two good races tomorrow and just see where the points fall. It has been “jumping into the fire” for me to race in this elite regatta after a four year hiatus from the Star. But the upside is I am getting one hell if a tune-up for the Star regattas I plan on sailing next spring. For complete results and some great video on pictures go to www.starsailors.com and starsailors on FaceBook. The forecast for tomorrow is more of the same. I am pretty fortunate to be down here in the Bahamas competing with all these great sailors! Perfect Star sailing conditions were delivered in Nassau today. 8-12 knots from the east and sunshine made the sailing spectacular for this elite fleet. Four races were held on Montague Bay at the east end of Nassau, each about 40 minutes. With just 18 boats on the track, and all of them very good, the racing was very tight. For Austin and me it went about as predicted. We struggled at the corners and shifting gears. We had some good starts and decent speed at times. But we aren’t consistent yet. Often it is just a matter of inches at the top mark that separates 4th from 12th. Same as it ever was. We are currently 16th and need to be in the top 10 after Friday’s racing. No doubt we will get better each day as I scrape a little more rust off. Robert Scheidt (BRA) and Bruno Prada were at the top of the field today and that is really no surprise. 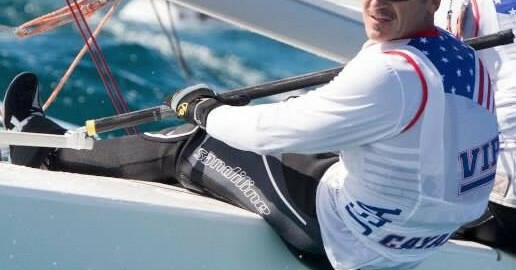 The Italians, Diego Negri sailed well to hold second overall and Mark Mendleblatt, the USA Star representative the London Olympics in 2012, sailed very consistently and is in 3rd. When we hit the dock, Robert Scheidt says to me, “Four races was a bit too much, don’t you think!” I said, “Did you just say that to me?” For those who don’t know, Robert is the epidomy of fitness and just won the laser worlds last week for the 9th time. Anyway, after a few minutes I decided it made me feel good to hear even Robert say that, it was a long day! For complete results go to www.starsailors.com. Forecast for tomorrow is 10-14 knots from the east. With about 3/4’s of the fleet finished, the Transpac results are posted now for the top positions. Samba Pa Ti had a clean sweep winning our class, the fleet and first to finish among boats without movable ballast. Onboard Flash, we finished second in class and second overall. A very credible placing. Upon our arrival here early Monday, much was made of the family make up of our team. The Cayard family and the Crum family made up half the crew. There were plenty of questions from the media such as, ?Did the kids get bored out there? How did Allie handle being with all those men for eight days? What did it mean to you to sail here with your kids?? and so on. Half way across, when we found ourselves surprisingly winning overall, the thought did cross my mind that maybe we should change our fun program into full race mode. But everyone was clearly enjoying themselves, the fast ride, the steering and all were smiling a lot. As Skipper Tom Akin said at our crew dinner on the eve of the start, the Flash program was about having fun and a great adventure. That is why I had decided to join Tom and to bring Allie and Danny. That is exactly what it was halfway across. It would have been wrong to change that. And not that it would have made a difference. In the end, Samba beat us by a little over 1.5 hours on corrected time. We ended up narrowly beating Peter Tong’s OEX who finished first in the 70 class and third overall. Samba sailed well but mostly they were well prepared. A lot of thought and planning went into how to sail a TP52 down this track with the weather that we would incur. They had some nice sails with different geometry and design to allow the boat to sail fast on angles in wind speeds where standard sails won’t let the boat go. Their navigator had them bang the right corner harder than anyone and had the wheels to make it work. I have sailed a lot with Samba Pa Ti in the past and I know how much effort and passion John Kilroy and his ever meticulous boat captain Eric Arndt put into their sailing. My hat is off to them and I am happy for them as well. As usual, I did lose a few pounds on the race and mostly right off that though mid section. It is very nice from a personal standpoint but you may remember that I will be crewing for Howard Hamlin in the 505 World Championship in just over a month and for that event I will need to be as heavy as I can be. So back to weight lifting and eating copious amounts of food. I started yesterday when Danny and I hit the gym at the Outrigger Canoe Club after surfing for a few hours. The we went out for a nice steak dinner at Chuck’s overlooking the beach and Diamond Head. The classic Waikiki scene! This morning I am leaving Hawaii for Sardinia and the Audi TP52 MedCup event onboard Artemis. This will be my first regatta with Torbijon Tornquist and his team who are very well prepared and take the TP52 racing very seriously. We will be training for four days before the racing starts next Tuesday in Cagliari on the southern tip of the Island. I am looking forward to getting back into this very competitive fleet after missing the first two events this season. I will of course be writing updates from Italy. For now, it is time to settle in for the 28 hour travel time trip. I am passing through SFO, but not enough time to get to Kentfield, so I am stopping in to see my mom and dad who live near the airport and change my laundry. Kind of like the old days. Akin, his crew and Jeff Thorpe, Criminal Mischief’s navigator, worked non-stop over a very short period of time to get Flash into racing condition. From the time the boat arrived in Long Beach, two weeks before the start, until the evening before they took off, the deck was strewn with rigging materials, sealants and tools. The work that they did paid off. With more than half of the Transpac fleet safely docked in Honolulu, Flash sits second in class and second in fleet. Allie Cayard, the youngest and the only female on board said, “There was never a dull moment. There was always something to be fixed.” Allie sailed with her brother and father, Paul. She also noted how calm it was dockside compared to out on the Pacific Ocean sailing the world’s most enduring and greatest ocean race. Transpac Update – 240 miles to go! There has been a lot of squall activity in the past 48 hours now that we are firmly down in the trade winds. Squalls are little storms that brew at the bottom of a cloud…a cloud that releases its energy in the form of wind and sometimes rain. In dealing with squalls, one tries to avoid the windward side of them and get lined up for the good “downwind” side. Sometimes this “line up” happens naturally and you are perfectly set up just by nature. Sometimes you have to gybe a few times to get the line up right. Onboard Flash, we did not have the natural line up so we did a lot of maneuvering to try to get a few bursts of wind. We also could not avoid two of the bad ones and we went very slow for and hour in each of those. It looks like Samba did a better job of getting the good part of the squalls. Another factor that could be relevant is that Samba set up to the west of us. In fact they were to the west of everyone, in the corner, and we were second most west. The whole rest of the fleet is inside is to the east. Maybe the west just had that much more wind. We have maintained or extended our lead on our competitors. This may confirm that the west is best. Anyway, we are still second in class and second overall this morning, relinquishing the top spots to Samba for the first time in the race. We never really expected to be challenging to win this race in first place, but once you get a taste of it, you don’t want to let go. Samba had a 1.25 hour lead on us in handicap at 0600 today. Anything is possible so we are pushing hard here. This non-stop, downwind sledding, is really fun. We have one more fantastic day of it today, as we will probably finish just shortly after midnight tonight. It has been a lot of fun and the whole crew of Flash thanks Tom Akin, our skipper for making it all happen. I will write a summary report in the next few days if I don’t write another one before the finish. You can follow the fleet by going to www.transpacrace.com and click on the Tracker. https://cayardsailing.com/wp-content/uploads/2015/01/cs_Logo-07.png 0 0 Paul Cayard https://cayardsailing.com/wp-content/uploads/2015/01/cs_Logo-07.png Paul Cayard2009-07-12 00:00:002014-03-21 16:21:18Transpac Update - 240 miles to go! About 680 miles to go. Well we got to our gybe point just about an hour ago. So far the wind is holding in the low 60’s (this means 60 degrees as in ENE, not 60 knots) and that gives us a great heading right at Hilo. A lot will happen between here and Diamond Head in terms of wind changes, so it is good to have some room out the the right to make some moves. We crossed gybes with Pegasus this afternoon…the first boat we have seen in about 4 days. We have been pleasantly surprised to find ourselves winning this race in calls and overall. We always knew Samba Pa Ti would be a strong player but we never imagined to be this competitive with them. It looks like one of the two of us have a great shot at winning the race overall. This has a lot to do with the good fortune our group had in starting with the great weather we had last Sunda,y as opposed to the weather the other two groups had earlier in the week. It is night now so the wind comes and goes as the clouds pass. Sometimes it increases to 25 knots and it is fast and furious on deck with plenty of water rushing down the deck. There is one of those going on right now so I am doing a lot of re typing as I write this. Everyone is looking forward to getting to Honolulu. I am trying to remind everyone about what a great spot we are in right now, “the momenta”, and to remember it because it will be over too soon and this only happens once a year if you are lucky. 2000 miles of downwind sleigh riding. That is what the Transpac is. It is like skiing for 8 days and never needing a chair lift. Off to the bunk for a bit of rest.